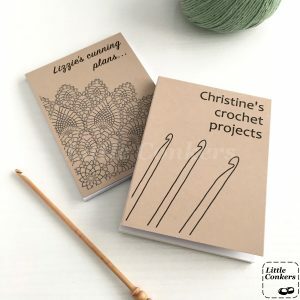 The knitting and crochet designs would make a perfect small gift for a keen knitter or crocheter – how about buying them for members of your knitting group, or for the person who taught you to knit or crochet? Or buy one for yourself – at A6 (89mm x 120mm) they are the perfect size to fit into your project bag. 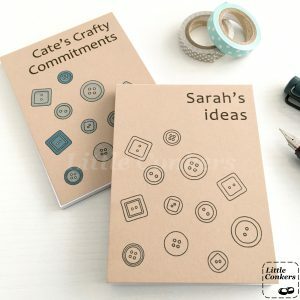 My all-new button design also comes in a range of colour options and is a handy little notepad for anyone. I can put any text you like on the front. 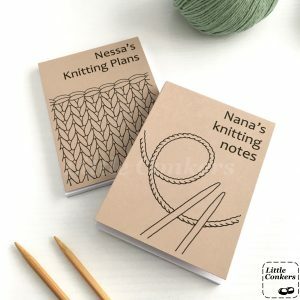 Personalise them with someone’s name or another message: “Megan’s crochet notes”, “To Granny, love from Ellie”, “My crochet notebook”, “Knitting Notes”, “Put this back where you found it”, etc. Choose from different fonts too. Many thanks to the volunteers who pre-ordered these designs so I could take pictures of them! 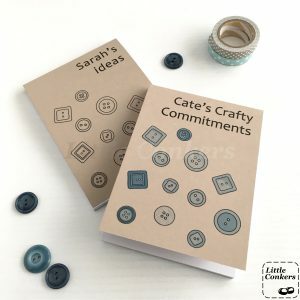 All the new designs also feature the very useful addition of cm and inch rulers on the inside cover – because you never know when you might need to check something! The pads contain approximately 50 plain white pages, easily removed to make useful notes and bookmarks in your pattern books. 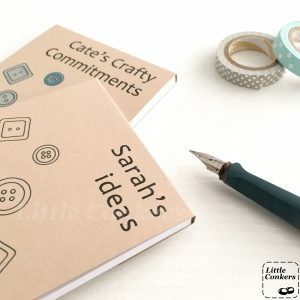 Find these personalised notepads in my Etsy shop now.